The MAIN EVENT for the Ireland Trip is now FULL. We are looking to add another boat, so please email the office should you wish to be placed on a waitlist for the Ireland Trip. As soon as we know on the additional boat, the organisers will contact you to confirm. NOTE: The two LEGS A + B are still available for booking. Please see below to book. We'll be sailing out of Baltimore which is in the South West of Ireland, we're going to embark on a one week tour of all the best bays, and harbour towns that sailing in Ireland has to offer. The sailing in these areas is far from easy, with a regular atlantic swell that rolls in regardless of the weather, and with tidal estuaries, and runs between the small islands. We'll have opportunity to visit the secluded bays to anchor for lunch, and will be spoiled for choice of little fishing harbours to pull into in the evenings. Pubs are more plentiful than houses, and as the pub owner is invariably the brother of the local policeman, you won't be thrown out at 11 if they're singing. It is still a very unspoilt section of coastline, and so is teaming with life. Whales and dolphins are common around this coastline, particularly, bottlenose and atlantic dolphins, harbour porpoises, fin and minke whales have regular sightings. There is an abundance of seals, and sea otters can be seen along the shore. Yachts Chartered will be a BAVARIA 50, Oceanis 43, Sun Odyssey 43. We won't be using the saloon berths so, we'll have plenty of space. Fly from London to Cork and transfer to Baltimore. Ryan Air, and Aerlingus fly this route. Sounds a little daunting, but it's a wonderful run, and will give you the experience of true oceanic sailing. You'll need an extra three days before or after the main trip if you choose to come along on one of these legs, and there will be a well deserved ping of guiness waiting for you at the far end when you arrive. As there are 3 separate elements to this trip, the trip out, the cruising around Ireland, and the trip back, we've set it up with 3 bookable stages. You can sign up to as many or as few of these as you'd like. If you just want to cruise, then just book stage 1. Should you wish to build up on some miles, then book on one or both of the Legs. If you only want to do the blue water sailing, and skip the Ireland cruise, that's also possible, just book onto the Leg you want. We'll join the boats in the early afternoon of the 7th, and get settled in, with a view to heading off on the cruise on the morning of the 8th eaFrom there, depending on the weather we'll most likely go west, but have plenty of options to the east if we need them The exact plan will be made in the weeks coming up to the event, when we have a better handle on where the wind will be coming from. 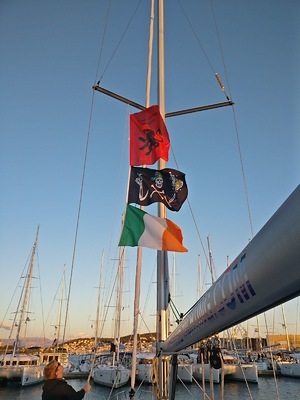 If you fancy getting some proper blue water sailing miles under your belt, then there may be an opportunity to bring one of the boats over to Ireland. If we get enough interest and a good mix of experience, we'll charter an additional boat from Hamble, and sail it across to the meeting point in Ireland. We'll assemble in Hamble on the Tuesday before hand, (the 3rd of September in the evening), and begin the 400 mile voyage across to Baltimore. There is ample opportunity to engage as much or as little as you'd like in the planning and execution of the trip. Night time cruising, watching the sun rise at sea, and the almost guaranteed dolphin visits are some of the amazing elements of an Irish sea crossing. For those looking to further their knowledge, we'll be maintaining two separate navigation modes, one using electronics, and the other, using purely traditional methods for the entire crossing. The predominant winds are either abeam or forward of abeam, which makes for good exhilarating sailing. In the Irish Sea, we will be exposed to the full might of the atlantic, and there is a good chance we'll get oceanic swell. Great opportunities to practice helming and sail trim. The return leg will be organised in much the same way as the outward let. We'll leave Ireland on the morning of the 14th and start our return journey. We should be back in Hamble on the Tuesday the 17th, all going to plan. The navigation methods will be the same as on the way out, but the sailing is likely to be different. It is most likely we'll be reaching and running for the duration of the trip back. Helming in dead downwind situations, with swell on the quarter is something all good sailors have to master, but often don't have much opportunity to practice. Safely goose winging the boat, and gybing in a controlled manner will be the areas we'll be working on. Prices do not include flights, Coach & Transfer fees, mooring fees, most food and drinks etc. £60 is the Deposit payment due at time of booking to secure your place. And the balance payment will be due on 1st August, payable by online transfer.